Houston metro-area high school seniors who have been admitted to the University of Illinois at Urbana-Champaign are invited to apply for the Houston Illini Club's scholarship! 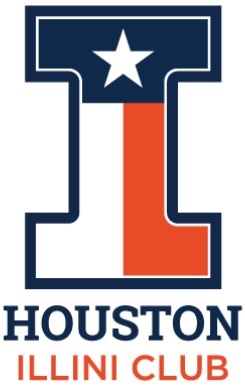 Each spring the University of Illinois at Urbana-Champaign's (UIUC's) Admissions Department provides the Houston Illini Club a list of all Houston area high school seniors who have been accepted to UIUC. In early April the Committee plans to send each such individual an e-mail with our congratulations of their acceptance to Illinois, and our encouragement to complete the club's scholarship application. For 2019 the club intends to award a $600 merit/leadership based based scholarship. If you know any top high school students considering the University of Illinois as one of their college destinations please encourage them to apply! View our gallery of our distinguished past Houston Illini Club scholarship recipients here! Not be a direct dependent of any of the below listed scholarship committee members, nor of a Houston Illini Club Officer.